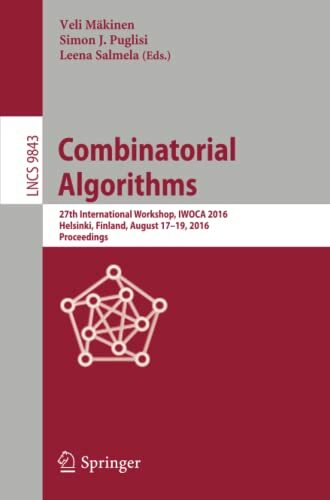 [PDF] Combinatorial Algorithms: 27th International Workshop, IWOCA 2016, Helsinki, Finland, August 17-19, 2016, Proceedings (Lecture Notes in Computer Science) | Free eBooks Download - EBOOKEE! Posted on 2017-11-16, by luongquocchinh. Description: This book constitutes the proceedings of the 27th International Workshop on Combinatorial Algorithms, IWOCA 2016, held in Helsinki, Finland, in August 2016. The 35 papers presented in this volume were carefully reviewed and selected from 87 submissions. They were organized in topical sessions named: computational complexity computational geometry networks enumeration online algorithms algorithmic graph theory dynamic programming combinatorial algorithms graph algorithms combinatorics and probabilistics. No comments for "[PDF] Combinatorial Algorithms: 27th International Workshop, IWOCA 2016, Helsinki, Finland, August 17-19, 2016, Proceedings (Lecture Notes in Computer Science)".